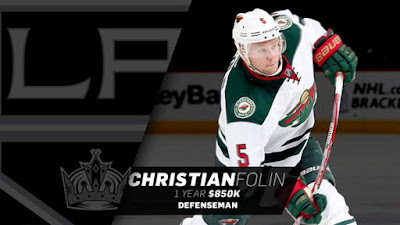 The Los Angeles Kings have agreed to terms with unrestricted free agent defenseman Christian Folin on a one-year contract, Kings Vice President and General Manager Rob Blake announced on July 1. Folin’s contract will have an Annual Average Value (AAV) of $850,000. The 26-year-old Folin (born Feb. 9, 1991) is a 6-3, 204-pound native of Gothenburg, Sweden who appeared in 51 games last season with the Minnesota Wild, recording eight points (2-6=8), a plus-10 rating and 26 penalty minutes. Folin has appeared in 118 games, all with Minnesota, where he has registered 23 points (4-19=23), a plus-15 rating and 50 penalty minutes.